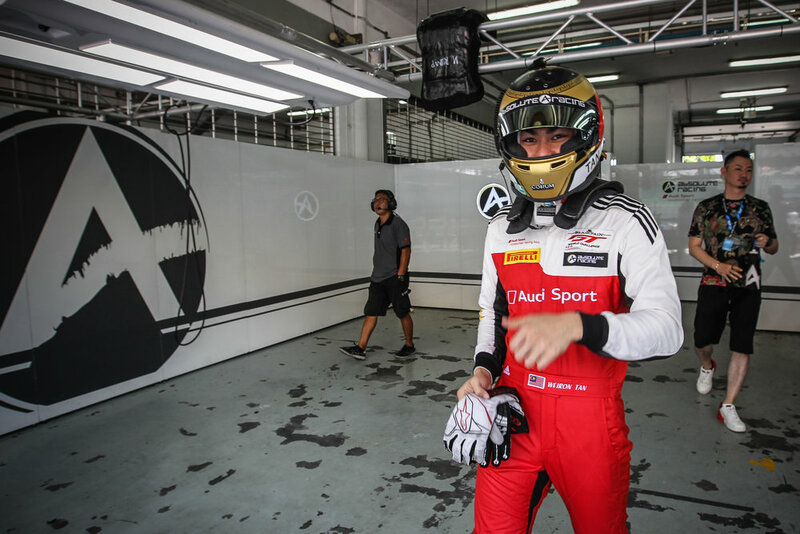 SEPANG, April 7th 2019 - Despite a challenging start to the weekend, hugely talented race driver Weiron Tan ended the opening round of the Blancpain GT World Challenge Asia series on a positive note. Weiron and fellow Audi Sport Asia Team Absolute Racing driver Martin Rump of Estonia finished Race 2 in third place in their GT3S class and placed a commendable fourth overall at the Sepang International Circuit today. The duo completed a total of 27 laps in one hour, one minute and 11.449s in their potent Audi R8 LMS GT3 Evo machine. Things were, however, tougher for the duo in Race 1 yesterday (Saturday) where they finished sixth in class and 16th overall. Weiron, 24, said there were many positives he could take away from their performance in Race 2 but also highlighted that there is still much room for improvement. "On a brighter note, today (Sunday) went much better than yesterday. A big thank you to the team for doing an amazing job from the practice sessions up to the race weekend," said Weiron. "Martin drove an excellent stint at the start despite there being a lot of pressure. I've learnt a lot from him since my first experience in this car. "Of course there are still some areas in which we have to iron out the kinks and perfect our approach to the race weekend. We are lacking some pace but overall it has been a good weekend. "We have some points in the bag and we will continue to improve, work hard and look to come back stronger for the second round." Weiron and Martin are now joint seventh in the drivers standings on 12 points. The second round of the Blancpain GT World Challenge Asia series will be held at the Chang International Circuit in Buriram, Thailand on May 11-12. Weiron made it clear that he is eager to build on his performance when he takes to the track in Northern Thailand. Weiron has already tasted success in Buriram in the past. "The next race will be in Buriram in May and it will also be a 30-car grid which will make it just as competitive," added Weiron. "I have driven there before in Asian Le Mans, the last time was together with Jazeman Jaafar and Afiq Ikhwan Yazid when we won on our debut as a team in the LMP2 class. "So I definitely have some good memories in Buriram, it is a circuit that I like and I am looking forward to going back there." Weiron thanked both Absolute Racing and Audi Sport Asia for doing an excellent job all weekend and congratulated all the winners in Sepang.